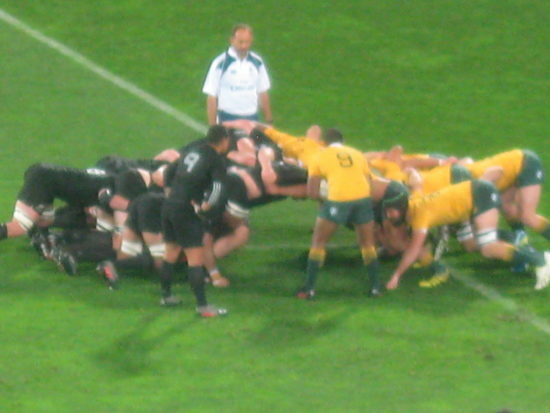 After a sound hammering by the All Blacks in the opening match of the rugby test series, the Australian team – the Wallabies, limped into Wellington for the second test. If your team is lacking in rugby acumen, skill and athleticism, how do you conquer the current All Black juggernaut? Answer – introduce niggle into the game, don’t back down, aggressively contest every situation and then if someone is going to be yellow or red carded, you have a 50% chance it could be the opposition. In a game that failed to reach great heights, the Aussies niggled away, but never looked like scoring a try. The All Blacks comfortably won by twenty points. On mild winter’s night we had sausages in the stand – Louisiana Andouille L’Authentique snarlers. 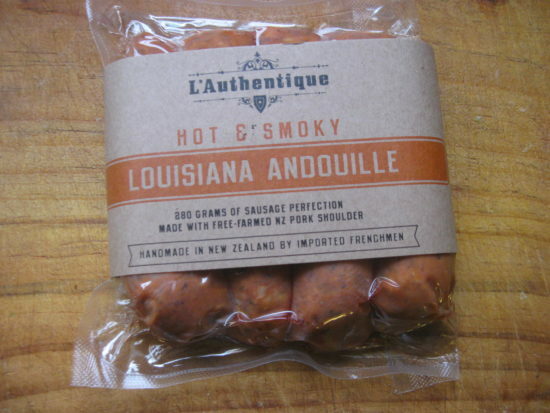 According to the packaging these are hand made by an imported Frenchman, are hot and smoky and are 280 grams of sausage perfection made with free farmed pork shoulder. These sausages were very nice. They are coarsely ground with the initial taste mild smoked paprika and cumin. This is followed by the flavour of smoky meat and to finish there is an extra kick of paprika. 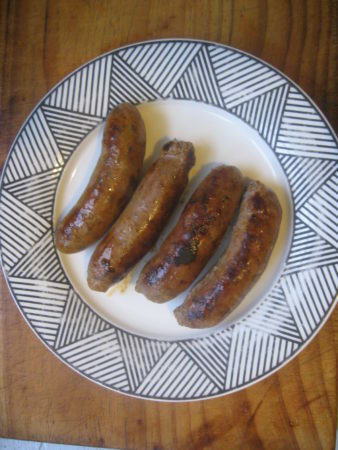 There is complexity and balance between the flavours, a very nice sausage that was enjoyed as the All Blacks put the Wallabies to the sword. As we left the ground an Aussie fan pranced around yelling out, “Women’s’ sevens! Women’s’ sevens!” The Australian beat NZ in the final at the Olympics. Good on them, however another win in the original game of fifteen a side was to be savoured. I would buy these sausages again.